In terms of revenue, the global anti-fog lidding films market is estimated to expand at a CAGR of 5.3% during the forecast period and is expected to reach US$ 933.5 Mn by 2027, owing to numerous factors, about which TMR offers thorough insights and forecast in this report. Request The Sample : https://www.transparencymarketresearch.com/sample/sample.php?flag=S&rep_id=46659? When high-moisture containing foods are packaged in plastic films, and the package is subjected to lower temperature, water droplets condense, which leads to the formation of fog. Fog formation causes loss of visual appeal and consumers assume that the quality has deteriorated. Manufacturers operating in the food packaging industry use anti-fog lidding films to prevent this. Among the various applications, the trays segment holds the maximum market share in the anti-fog lidding films market and is expected to have a positive outlook during the forecast period. Asia Pacific is estimated to be the largest consumer of anti-fog lidding films and accounts for nearly 30% of the global market volume in 2018. 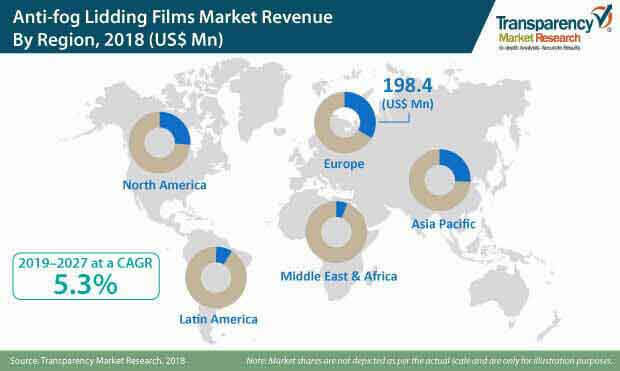 In terms of CAGR, Asia Pacific is expected to remain the most attractive region for anti-fog lidding films which can be attributed to the rapid growth of food delivery services and outlets in the region. Anti-fog lidding films can be made up of various materials including PET, PE, PP, and PA among others. Among these, PP is the most preferred material for developing anti-fog lidding films and is expected to generate incremental opportunity of US$ 66.5 Mn by the end of the next five years. Emerging economies are expected to create substantial demand for packaged and processed food. Per capita consumption of packaging in emerging countries is far below the global average. However, the demand for packaged food is increasing rapidly and is expected to create lucrative growth opportunities for flexible packaging manufacturers in the region. Moreover, most anti-fog lidding film manufacturers are targeting the customer base in emerging economies such as Brazil, Indonesia, India, and ASEAN countries. Manufacturers of anti-fog lidding films are expanding their operations in emerging countries through strategic mergers with multinational players or acquiring small-scale regional players. India, China, and Brazil are expected to represent an attractive incremental opportunity for the global anti-fog lidding films market in the coming years. Countries of Middle East & Africa have a relatively lower adoption rate of anti-fog lidding films, which is expected to pick up pace during the forecast period owing to growth in consumption registered by packaged and processed food industry in the past few years. GCC Countries are anticipated to hold the maximum share and observe significant growth in the anti-fog lidding films market owing to the entries of global foodservice chains. North America is expected to house key anti-fog lidding film manufacturers. In the North America market, the U.S. is estimated to hold more than 25% of the global anti-fog lidding films market. Growing use of anti-fog lidding films for lidding applications of ready-to-eat meals, dairy products, as well as fresh produce is anticipated to drive the demand for anti-fog lidding films in the region. Demand for anti-fog lidding films is expected to grow at a steady pace in Europe owing to established demand for lidding solutions for trays, cups & bowls, and jars. In the global market report for anti-fog lidding films, the competition landscape is discussed. Key players profiled in the anti-fog lidding films market are- Uflex Ltd., Toray Plastics (America), Inc., Plastopil Hazorea Company Ltd, Effegidi International S.p.A., Sealed Air Corp., Berry Global Inc., Flexopack SA. Winpak Ltd., Coveris Holdings SA, Flair Flexible Packaging Corporation, Rockwell Solutions Limited, RPC bpi group, Cosmo Films Ltd., Bemis Company Inc., ProAmpac LLC, Constantia Flexibles Group GmbH, Mondi Group Plc, Transcendia Inc., American Packaging Corporation, Hypac Packaging Pte Ltd. and, LINPAC Packaging Limited.